Grosse Isle: Canada's immigration point. Canadian immigration records. Coffin ships. 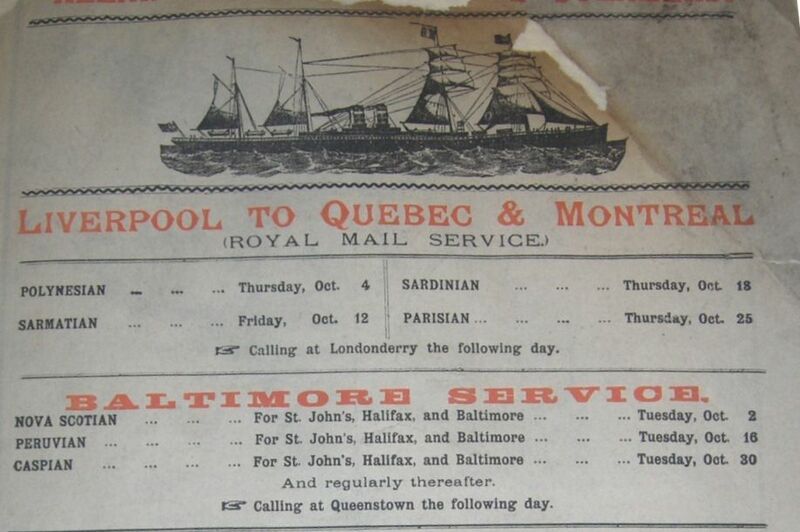 Canadian immigration history dates back to the 17th century when the land was colonised first by the French in Quebec and then by the British in Newfoundland. While a good few thousand men from the counties of Wexford and Waterford played their part in early Newfoundland history, the Irish didn't arrive in significant numbers until the 18th century. By the end of the first decade, Canadian timber merchants were doing great business supplying the British Navy which, at that time, ruled European waves. Merchants recognized they could make extra profit if, instead of returning to North America with empty vessels after delivering their cargo, they loaded their ships with would-be settlers. They started to promote migration and, in time, the Government realized this could relieve what they believed to be the over-population of Ireland. 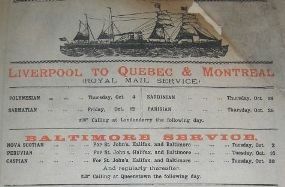 his stage in Irish-Canadian immigration history gathered momentum in the 1760s when advertisements appeared in Ireland's Ulster province offering "industrious farmers and useful mechanics" the opportunity to emigrate to British North America (as Canada was then known) with the promise of at least 200 acres of land per household. Some 300 new settlers took up the challenge, arriving in Halifax, and the following year they were joined by 170 immigrants who sailed from Londonderry and settled the New Dublin area. Another sizeable group of Irish immigrants arrived in 1823-1825. Mainly Catholic paupers from counties Clare, Cork and Limerick, they created a 2000-strong settlement in Peterborough, Ontario (named after Peter Robinson who commissioned the twelve ships that carried them). This, too, was successful, and was followed by several years of active emigration, principally from Britain (which then included Ireland). In 1831 alone, 34,000 Irish immigrants arrived in Quebec. 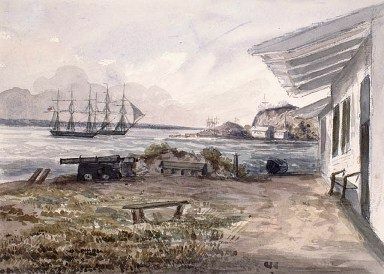 It was also to become the setting of the most tragic events in Canadian immigration history: the arrival of thousands of sick and dying Irish immigrants fleeing the famine that gripped Ireland in the late 1840s. In 1846, an estimated 33000 people of all nationalities landed at Grosse Isle. The following year the number rose to 84,500. Nearly 70% were Irish and many suffered from what they called 'ship fever'. It was actually typhus but it's hardly surprising they blamed their illness on the boats they arrived in, for conditions onboard were horrendous and perfect for disease to spread. About one-sixth of Irish passengers died during their voyage or shortly after landing. No wonder the immigration ships from Ireland became known as 'coffin ships'. But the illness wasn't confined to the ships. Grosse Isle was also hopelessly underfunded to cope with such an influx, sick or not. Accommodation was woefully inadequate and medical provision was insufficient. Inevitably, the disease spread among the supposedly healthy. Doctors, nurses, priests and even the Mayor of Montreal died alongside the immigrants. As news of the 1846-47 tragedy spread, those Irish emigrants who could afford it, preferred to immigrate to the United States rather than Canada. This wasn't an option for all immigrants, of course. 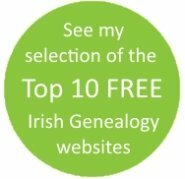 See if your Irish ancestors are on the Passenger Lists of Peter Robinson's Irish settlers 1823-1825. Find out where you can access records of Canadian immigration. The tragic part played by coffin ships in Canadian immigration history. Return to Irish emigration main menu. "Information wanted of Abraham Taylor, aged 12 years, Samuel Taylor, 10 years, and George Taylor, 8 years old, from county Leitrim, Ireland. Were landed in Quebec about 5 weeks ago, their mother having been detained at Grosse Isle. Any information respecting them would be thankfully received by their brother William Taylor at this office."